Home Apps Free Quiz App For Windows 8: What if..
Free Quiz App For Windows 8: What if..
What if.. is a free quiz game app for Windows 8 and 8.1. 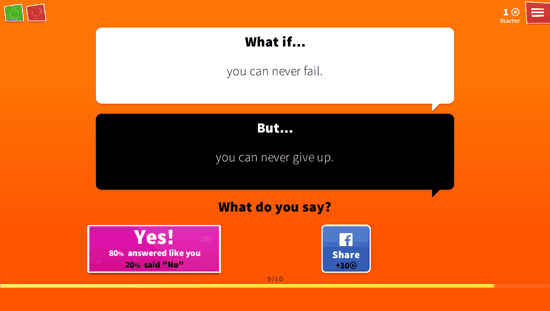 The game is based on the questionnaire where the users have to answer different questions given to them. The questions are in a form of “what if..” here there will be a situation given to you, then in the question you will have “but” written, where you will have a situation put in to force you choose your answer to the question accordingly. The questions do not have any difficult options as answers but just a yes or a no. Your answer can be from either of them. But the questions can sometimes be tricky. There are different levels in the game that can be completed to earn stars and higher rating. When you answer a question, the game will also tell you how many people answered the same. There are different options that you can access by clicking on the top right side red button. The options let you access the shop where you can purchase different background colors and modes; you can also create new questions and follow the stats of it. In the stats page, it will show you how many answers you gave were similar to the majority and how many were different. You can also login to your Facebook account to access more options. By logging in to your Facebook account in this quiz app, you can also earn coins. You can up vote or down vote the questions that you answer whether you like them or not. You can also check out other quiz related apps reviewed by us like flashquiz and quiz maker app. The colors of the game are set to be simple with little depth in the tabs and menu options. The graphics of the quiz app is minimal. The layout of the game is nicely designed and it has all the buttons and tabs very well placed on the app.